Editor’s Note: Part one of this story ran on May 3. This is part two of two. The city is currently considering three options for re-use of the old city hall site – two hotels and one mixed use. City Council heard the proposals April 23 during a very well attended afternoon study session about how to re-use 3300 Newport Blvd. Proposals for hotels came from RD Olson Development and Sonnenblick Development, while a mixed-use proposal came from The Shopoff Group. 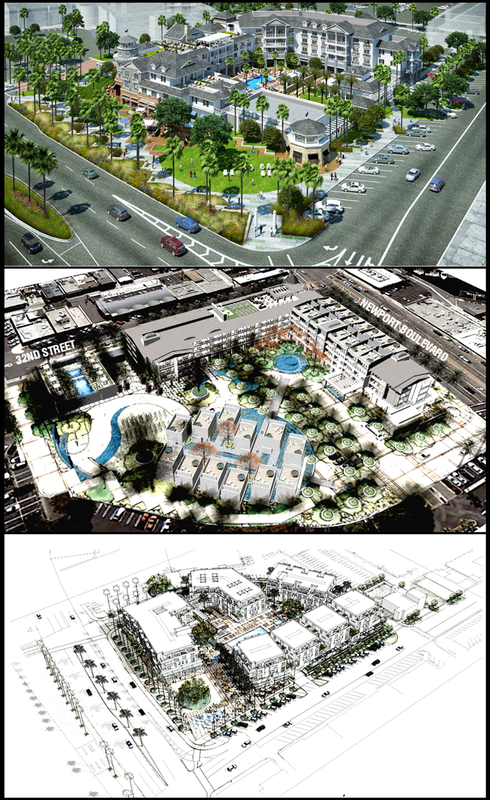 Artist renderings of the projects proposed from (top to bottom) RD Olson Development, Sonnenblick Development, The Shopoff Group. “The right decision is extremely important to the Lido Village area and the city,” said Denys Oberman, a peninsula resident. The city has a responsibility to choose the project “best suited for the community,” she added. Community response at the meeting was largely in favor of a hotel, with many speaking during public comment, including Lido Isle Community Association spokesman, Hugh Helm, who mentioned a resident poll the association conducted, with 98 percent answering in favor of a hotel. The re-use of the old city hall site is the first step needed to revitalize Lido Village, he added. “I’d like to see the project move along as quickly as possible, but in a diligent way,” Oberman said. The staff is currently reviewing the three proposals with their consultants, said Kim Brandt, community development director, and hopes to make a recommendation to council by June. “Once we conclude our review, we will present our findings to the City Council in a staff report that will of course be made available to the public. We are hoping to get back to council in June,” Brandt wrote in an email. Oberman questioned the transparency with the city and asked for the economic assumptions and benefits sections of the proposals to be made public. It’s great that the city is reviewing them, she continued, but the public should be able to do the same. “A portion of that will be made public,” Brandt said, possibly as early as today. Other parts of the proposal will remain confidential, she added. Ideally, Oberman said, she would like the community to be able to fully review the proposals and give feedback to each and the council. Once the selected portions are made public, residents can review them and contact their city councilman or city staff to voice their opinion. There will also be public comment during the council meeting when staff presents their findings. Staff reports are typically made available the Thursday before the meeting. Oberman, along with others locals, strongly favor the hotel option, she said later. Both of the hotel proposals have elements of attractiveness and potential concerns, she added. Bob Olson’s project is a 130-room boutique hotel called the Lido House Hotel. The estimated total project cost is $43 million, Olson said. The facility would include a restaurant, spa, fitness center, bay to beach park, ballroom and meeting room, rooftop lounge and viewing deck. The project from Robert Sonnenblick is also a hotel consisting of 20 town homes, 12 villas and many guest rooms. The cost range for the proposal is approximately $70 million, Sonnenblick said. The Sonnenblick property would include public courtyards, plazas and promenades, two restaurants, rooftop bar, lounge and event area, health spa, several water features, outdoor event areas, meeting space, and 210 below grade parking spaces. The mixed-use proposal comes from William Shopoff and includes 99 luxury apartment homes and 15,000 square feet of upscale retail space. The estimated project cost will be approximately $60 million, Shopoff said. The commercial area would include restaurants, community meeting room, pedestrian walkways, water features, a parking garage, and a town square and public plaza. The city may seriously consider an apartment complex because the money is guaranteed, but they may also want to take advantage of the revenue a hotel could bring in through TOT taxes, speculated Edward Cook III, longtime Lido resident and co-president of McCarthy Cook & Co., a real estate investment and development firm. A few of the key issues behind the proposals include projected revenue for the city, revitalizing the struggling surrounding retail, how it fits in with the community, financing of the project, if it makes economic sense, parking, and the use of the two landmark ficus trees. All three said their project makes economic sense. Shopoff maintains that his mixed-use proposal offers the lowest risk for the city. It’s lower risk because their proposal is 100 percent equity and zero debt, Shopoff explained. They have committed capital, he added. “Those issues can’’t be overlooked,” he added. As far as financing goes, Sonnenblick feels confident his current connections are more than willing to go forward with this project if chosen. He has the unofficial backing of two Los Angeles based banks for the construction loan and pension fund partner for equity, they are just waiting until Sonnenblick is chosen to finalize, he said. Sonnenblick is also waiting until their project is chosen to include Auberge at the meeting or available for commenting. Olson is also confident in his company’s ability to finance their project. The economic plan for his project is feasible, he said, because they know their costs and expect a certain amount of return for their investors. “It’s our business, and we know our business very well,” he added. Bruce Baltin, senior vice president of PKF Consulting, is working on the Olson project. Before teaming up with Olson, Baltin worked as a consultant for the market study for the city. The market study, which Baltin emphasized was independent from any developer, found that it is a good opportunity for a hotel, he explained. The economic power of a hotel is very good, Baltin said, because 100 percent of the TOT taxes go directly to the city. Guests on vacation tend to spend more on a daily basis, they eat out every night, they shop at local stores. Olson has a good track record, a fitting project for the market and a solid proposal, Baltin said. “That’s why investors will finance it,” he said. How much each project will need varies and one difference that plays a major role in cost is parking. The $43 million cost estimate for the Olson project is lower because they don’t have the parking demands the other proposals have, explained Olson, whose project includes expanded public parking on 32nd Street to 150 spaces. “We aren’t forced to do underground parking and take on all the excessive risk that comes with building a parking structure into the water table,” he continued. The risk, he continued, from issues regarding the environment, risky construction, and state regulations. Comments from residents have also expressed concern that underground parking at the old city hall site is risky. No so, countered Sonnenblick, whose project involves this type of parking with 210 spaces and removes public parking on 32nd Street. His company and their general contractor, C.W. Driver (who also built the new civic center in Newport Beach), are very comfortable with their ability to build one level of below-grade parking on this site, he wrote in an email. Environmental impacts can be “easily avoided with proper engineering,” he added. “Parking is critical for a hotel’s success and it’s critical for the surrounding neighborhood,” Sonnenblick said. There needs to be more of a focus on parking, he added. ‘(The Olson hotel team members) are tremendously mistaken on their plan with parking,” he continued. Neither hotel proposal seemed to have efficient or adequate parking, countered Shopoff, whose project includes 325 spaces from an expanded area on 32nd and a parking structure. Another premium feature are the special landmark ficus trees. The ficus trees will be preserved with both the Olson and the Shopoff projects, they will be moved to different spot with Sonnenblick’s proposal. Olson noted that he thought the trees were too fragile to be moved, but Sonnenblick felt by transplanting them to a more a more public place makes the hotel design more efficient. The potential timelines for each project are similar, about one to two years after breaking ground, which could be as soon as next spring. Cook recommended looking at the track record of each proposal, consider if their other projects are outside the area or if they have local experience, and their financial capability. It’s an interesting and exciting opportunity, Sonnenblick said. The city is fortunate to have three quality proposals to sort through, Shopoff added. It’s a big responsibility, Olson said, and the community is depending on the city.